I'm a big race fan. Not always completing them myself (I'm still the girl who can't sleep the night before a triathlon) or being a good cheerleader at them, but I love learning what drives others to toe the line. With the Life Time Chicago Triathlon this weekend, it only seemed fitting that I share some stories from triathletes who'll be competing. That said, meet Jim Bey. Based on race times alone, Jim Bey, a 47-year-old triathlete from Naperville, seems like your average age-grouper. Sure, he has a speedy swim time thanks to his days as a collegiate swimmer, but he's comparable to the rest of the field on the bike and run. And he's fast enough to qualify for the USA Triathlon Nationals, which he competed in two weeks ago. But Bey's road to the start line is a little different from most of the men he's racing against. For starters, he's lucky to be competing at all. Bey broke both of his legs and sustained other injuries in a serious car accident nearly 20 years ago. The driver of the vehicle died when the car hit a pole; Bey was fortunate enough to land himself in the hospital for a few months. Sure, it wasn't an easy recovery, but Bey was determined to walk again. He still walks with a limp, which might be why most people are amazed when they learn that he's a triathlete. And Bey's not just your average triathlete who does a race, maybe two, a year. 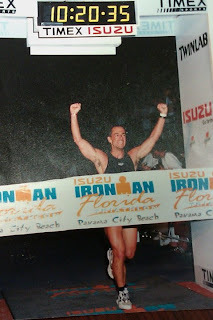 He says that he's completed at least 100, including four Ironmans. 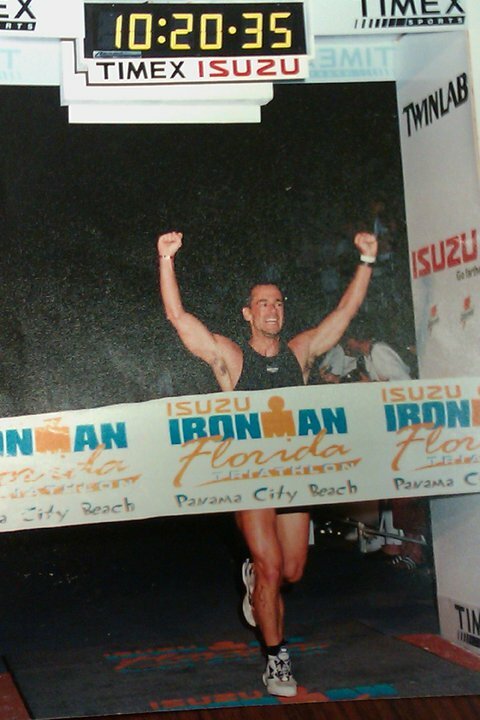 Until his son was born and family because more of a priority, he was racing at least five triathlons per season. When Bey toes the line on Sunday, he's shooting for a goal greater than just finishing the race. He's competing in the sprint distance in hopes of winning his age group. He won it in 2011 and finished second last year. Considering he'll be one of the first swimmers out of the water in his wave, he stands a good chance of holding off his competitors. Accident? What accident? For more details about Sunday's triathlon, check out chicagotriathlon.com. Photo courtesy of Jim Bey.